For the very first time since I started tracking my weekly weight on Jan 13th, 2014 with an initial weigh-in of 316.2 lbs we have our first weekly weigh-in under 240 pounds with an official weight of 239.4. My current average weight for July is now at a very respectable 242 pounds and that’s worth discussing a bit more. Since there are 5 weigh-ins during the month of July, each 1 lbs variance on the scale for my final weigh in of the month will influence the average by 0.20 lbs (1/5th of a pound) That figure may be derived by taking a single pound and dividing it by the number of weigh ins during the month. Hence, 1 lb divided by 5 weigh ins equates to 1/5th or 0.20 lbs. What does that all mean? – Basically, any final weigh in between 239 and 243 pounds will maintain my average weight of 242 since my spreadsheet rounds my average weight to the nearest pound. Any weight next week less than 239 will reduce my average and any weight above 243 will increase my average. The 242 average will give my the third goal, body weight in the low 240s and I’m at 94 miles for the month so even the minimum of 1 mile per day running to maintain my current running streak will put me at 103 miles for the month which will check off the 4th goal listed for 2015. I’ll finish July out with at least 376 miles for the year which compares very nicely with my entire total miles for last year of 391 miles. Either by the end of August or the first week in September I’ll hit my final goal of 500 miles for the year. Visually, what I can see by the end of this year are an average bodyweight in the 220s, maybe the low 220s and there’s a good chance of seeing weight in the teens – 21x’s and perhaps even an average in the 210s range. I’ve started writing some reviews for BibRave.com and below is my review copied from that site starting with OVERALL. A few additional pictures have been added towards the beginning which are not found on the BibRave review. OVERALL – This is a great race and run very well by the race directors. Starting at midnight the race is unique and can pose an extra challenge if you are traveling a long way to get there. 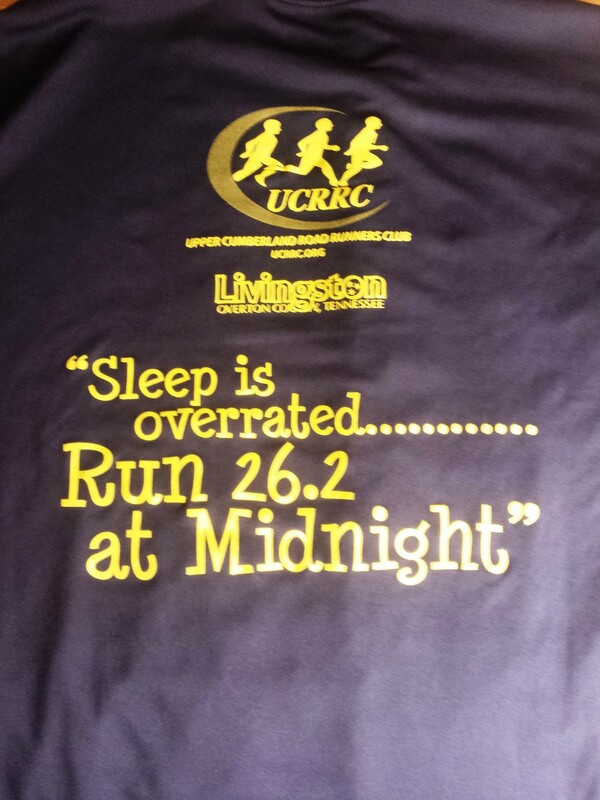 For me, my Friday started out at 4:30 in the morning …with a short 1 mile run to keep up a running streak and after a 6 hour drive to my hotel in Cookesville, TN my attempts to get even a couple hours sleep before the race did not happen. 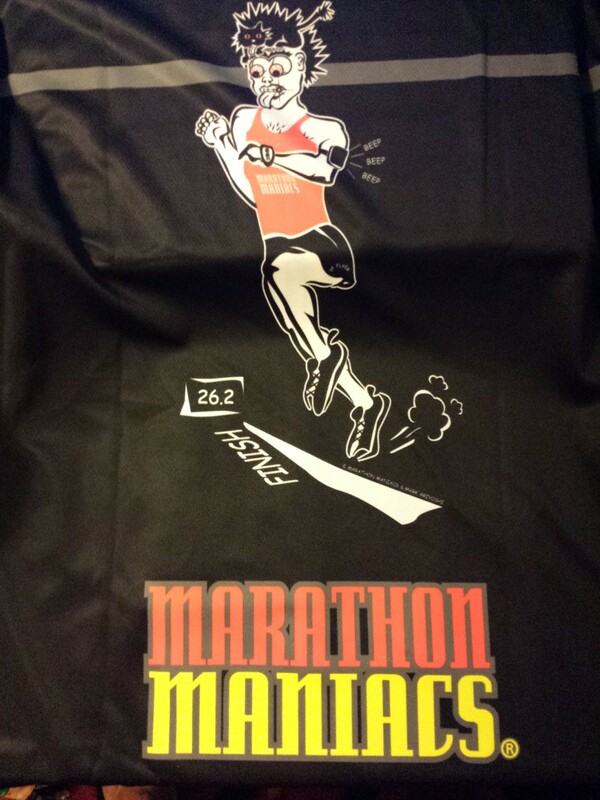 The packet pick up is from 8 p.m. to 11:30 p.m. that Friday night with the race starting at midnight. by the time I finished the run I’d been up well over 24 hours straight. Getting there a day earlier may be something to consider if traveling a great distance. 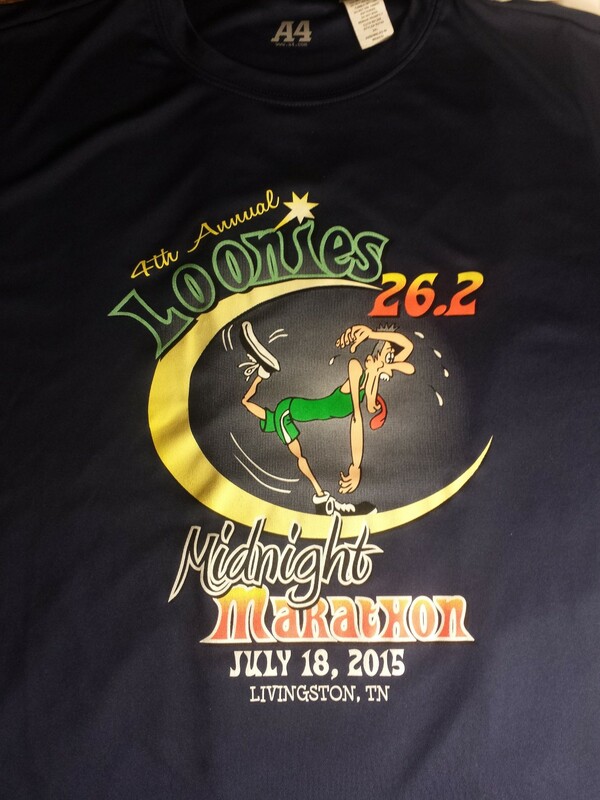 The Loonies race is limited to 300 people and a little over an hour East, South/East of Nashville, TN. I signed up rather late since I was scrambling to qualify as a Marathon Maniac so Cookesville, TN was the closest hotel I could get. I stayed at a Best Western/Thunderbird Inn and was very happy with the hotel. The drive was a pretty short 30 minutes to the start of the race. T-SHIRT/SWAG – Very high quality. Such high quality that I almost felt as if I was relation to a rich little family. 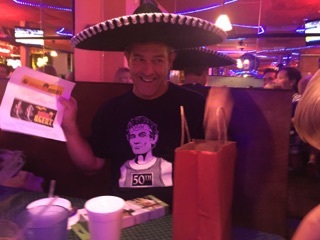 Super nice tech t-shirt and a Loonies hat which is very nice and not something usually received. The medal is probably my favorite ever, 2nd only perhaps to the first marathon medal ever received some two plus decades ago. AID STATIONS – After the initial 1.2 mile loop, there were five 5 mile loops with 3 aid stations which all featured water and gatorade. If you want or need GU, you’ll need to bring your own. I finished towards the end and there were about 30 pizzas ready & waiting for consumption as well as an ample amount of snacks and typical post race food. COURSE SCENERY – The course is ran starting at midnight so there isn’t too much to see other than the dark lit town of Livingston, TN which isn’t so bad. Along the start of the race we run by each lap there is a row of vehicles – tents, RV’s and people cheering on their loved ones running in the race and it’s always fun to get a constant influx of cheers and applause every lap. That is a benefit of lap structured marathons. With more typical long route marathons you may see a bunch of support at the beginning and the end but you’re pretty much solo in the distant miles. EXPO QUALITY – No expo. ELEVATION DIFFICULTY – One short area of the race had a bit of a hill but, after a couple laps you barely notice it anymore. Mostly flat terrain. There were 6 people in the 2015 race who qualified for Boston as the race distance is certified. PARKING/ACCESS – Very easy and ample parking for all – runners and spectators alike. RACE MANAGEMENT – High Quality. Not only was my experience positive for this 4th Annual race but everybody else I talked with who had run in previous years all had positive comments. Yesterday morning my weekly Thursday weigh-in put me at 241.6 which I believe might be the lowest weight I’ve recorded since I started taking measurements in January of 2014. 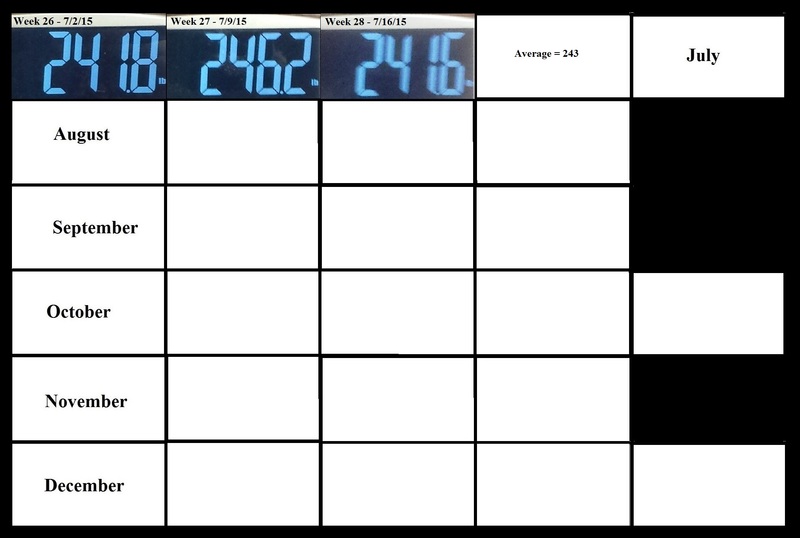 For the record I’ve uploaded all three of my weekly weigh-ins to my About Dr Scott tab, all of 2014, the first half of 2015 and what I have so far of the second half of 2015. My average weight for this month is now standing at 243 which represents a good change from the previous month’s average of 248. I’m not sure if I’ve talked about this too much but I see getting overly emotional about the scale changes as more of a symptom of a problem. Hitting my final two weigh-ins of July in the 240s will be a good success and a final average in the low 240s or under 245 will be another success. about 18 1/2 hours from now I’ll be embarking upon another marathon. It’s about a 5 1/2 drive to get to this marathon so I’ll be leaving home within the next 5 hours or so. I will have to get some sleep in before midnight tonight otherwise I’ll find myself in mile 20+ of a marathon 24 hours from now after being awake for 24 hours straight. I’m in a Running Group on facebook called July Fun Pick One 50, 60, 70, 80, 90, 100?. It’s a name that doesn’t exactly roll off the tongue and the name of the month switches with every month but it’s been extremely helpful with my running. 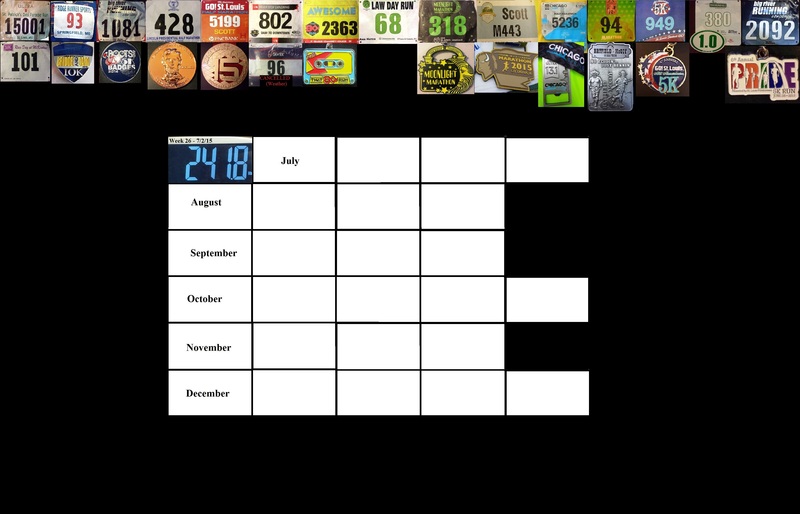 The premise of the group is simple, everybody picks a mileage amount at the beginning of the month they want to hit for that month then post their runs everyday along with how they are progressing towards their monthly goal. for me, it’s 62/100 which means I’ve gotten in 62 out of 100 miles for the month of July. It’s probably the most inspirational group I’ve ever been a part of. I’ve learned about Run Streaks from that group, simply running every day. 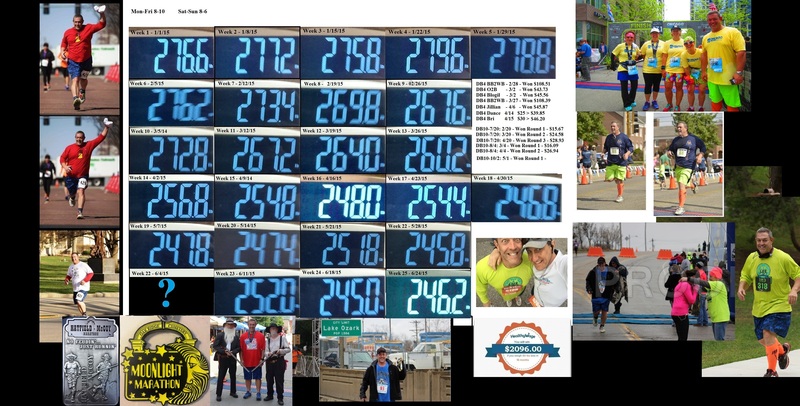 There is an organization called the United States Running Streak Association (USRSA) (http://www.runeveryday.com/) and they maintain an active (and retired) list of everybody’s run streak on on their Official USA Active Running Streak List. The top two people on that list have run every day for the past 45+ years. There are 106 people on that list who have been running daily for over 20 years. We have one guy in our facebook group, Marvin, who is on a quest for 1,000 days straight and another really nice guy from Arkansas who will be on his 199th day straight today. I decided to try a run streak for the month of July so I’m at a 16 day streak right now and, I have to say, I’ve been getting some pretty favorable results. It only takes a run of any pace, of at least 1 mile to maintain a run streak. I’ve been noting my Streak with an extra notation on my Instagram post with RSD16 which stands for Run Streak Day 16. Partly, it’s a mental game. The time required to cover a mile isn’t much – scarcely over 1% of a person’s day even for the slowest of people. Hitting the road and running or walking for even an hour is only about 4% of a person’s day but, I prefer to look at it as having 96% of my day SuperCharged. Giving myself 96% of a day that is going to be more productive and happy. There’s no guarantee everything is going to be great throughout a day of life given a run but I do believe there is an enhanced propensity for things in life to be better, to see things through a clearer lens and, should things be bad, to help lessen and soften those blows and allow a person to be able to better handle tough times. This Run Streak notion also goes back to a book I read through in high school called Red Gold – that Soviet Training book and it mentioned doing something everyday regardless of what it is – I’ve given the example they gave in the book of touching a light bulb everyday so, it can be something innocuous. Some of the best attempts I had with this type of psychological training has been with games in the past. Last year, I had a 152 day streak with a website called duolingo.com which I used to help study the German language. Sometime in August that website is slated to have Russian available which I’m also interested in so I may start another streak with that language. A running streak though… now we’re getting into something abundantly useful and pragmatic. Speaking of streaks – there is something called VEDA coming up which stands for VLOG Everyday in August and VEDA is also used for April as well. I’ve created a new channel on YouTube called i can run a minute to use for this new VLOGging venture. I still want to beef up the teaching videos I have on my regular YouTube page but, it does take a certain skill set to put up a video and I have been learning a lot lately. The administrator of the Slow Runner’s Club on facebook is a guy that goes by the name of Zen Runner and he is hosting a group of us in yet another group called ZENVEDA. He’s expanded the VEDA concept to also include blogging and podcast as well as VLOGs. Well, it’s time to focus and take control of this brain of mine. A few hours of work and last minute prep, as well as a quick one mile run to keep my run streak alive is all that’s between me and a quick trip to Livingston, Tennessee. 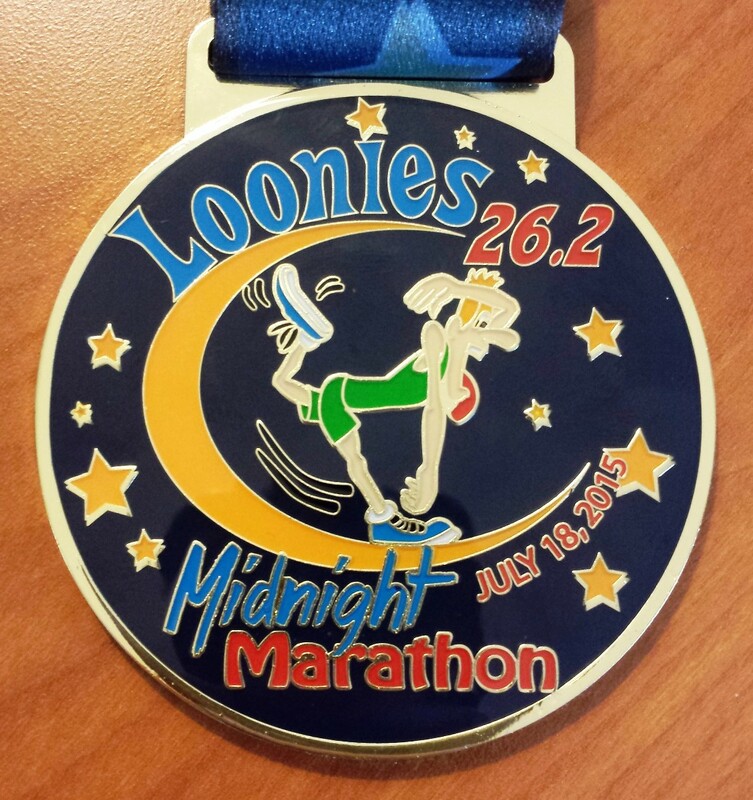 it’s Wednesday – Saturday or…Friday night at Midnight is when this Loonies marathon is set to kick off and I’m pretty exhausted. I’ve got three bottles of water and I’m going to finish those while blogging here then head over to my brother’s house to help him rip out some shrubs or trees or something so he can get a new shed put in this weekend. I figure dehydration may be one reason for feeling so tired, hence the extra 3 bottles of water before I head back out into the sun. I also have individual 20 oz bottles of Gatorade and have been drinking at least one of those every evening before bed along with double doses of vitamin packs each day to help make sure I’m topped off on electrolytes, minerals, vitamins and anything else that may be necessary for completing a marathon. That strategy seemed to work pretty well for my first marathon this year – about 66 days ago. This Saturday will be my third full in 70 days. I’ve been working on my “About Me” page. Last year I thought I was going to whip myself in shape quickly enough to knock out a 4:22:00 or maybe even a sub 4 hour marathon by the end of the year. I wasn’t even close to that much less close to being able to complete a 26.2 mile distance but, I’ve been thinking about the past reality I had to work with. Back in 1994 I took a running class at SIUE over the Summer. 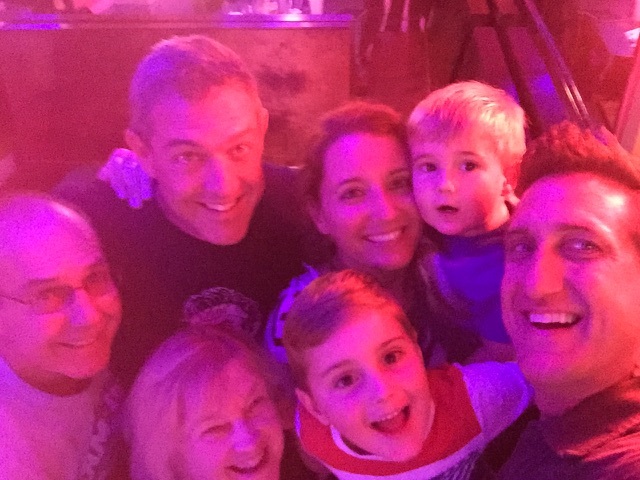 It was a simple Mon, Wed, Fri class that met at 6 a.m. and it was only 3 months after that class when I completed my first marathon in about 4 hours and 30 minutes. Not too shabby for a non-runner and only 3 months total training. 10 years later in 2004 I did not train AT ALL. I went to the Spirit of St Louis Expo on a Friday and signed up for the marathon that was held that Sunday. On Saturday, I went to a local park and jogged the 1.5 mile path and that was it. Mentally, I just needed to see that I could cover some distance. That marathon took me about 5 hours 42 minutes and that is the first marathon where I can actually look up my time online. These days ….we’re adding about 2.5 hours to my first marathon time but, at least I’m covering the distance this year. I have no illusions about my speed. That website ranks me in three categories: Distance, Devotion & Speed. for Devotion/Discipline/Dedication I am now ranking in the 85th percentile overall. 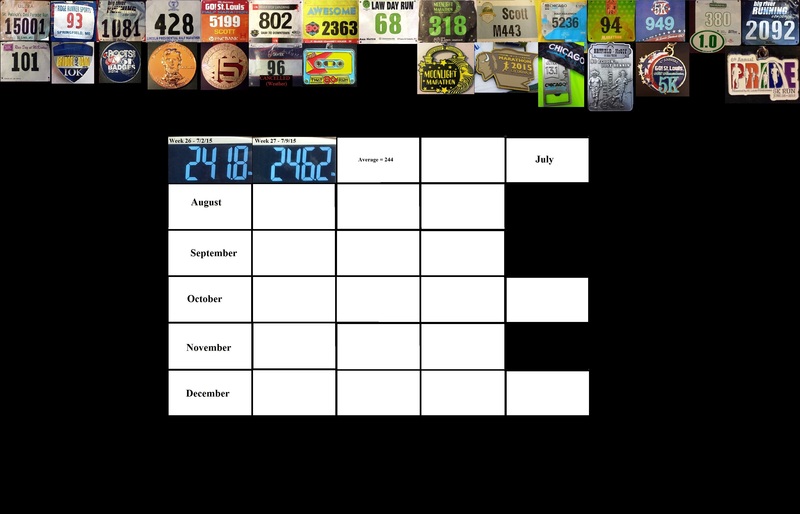 I’m doing a run streak now for the month of July which is why I’m at 100% for the past 14 days but the other time periods keep increasing in value as well. So, theoretically, If I were to run 365 days straight I would be at 100% for all time periods but, as is, I’m still ranking in the 85th percentile which is the minimum for the Gold level which I just achieved yesterday. My 7 and 30 day mileage is quite a bit lower than just last week, mainly because I’ve been cutting back on the mileage in anticipation of the upcoming marathon. at best I was showing 40 miles for 7 days and 106 for the past 30 days. Of course, after this Saturday those numbers will be inflated for a bit due to the extra 26.2 miles but …those miles will be retained considerably longer for the 90 and 180 time spans. Between the running streak and occasional twice a day runs I should be able to hit and hopefully maintain a good 100 miles per month worth of running. Speed is my weak point. My best rank here is at the 40th percentile for the 1 mile run and all other distances are single digit percentiles. you know….I did analysis on the GO! St Louis Marathon and there was a hefty chunk of people that came in with times between 2:30 and 3 hours. I did like 2:51 so, within that group there’s no way i was in the 1 percentile with 99% people better. But, SmashRun is a fairly new website which is still in it’s beta stages and still developing. There are several thousands of people using it and I would guess that most of them are pretty serious runners which would be a lot different than the GO! half marathon which attracts a very large spectrum of running abilities. Still, the reality among serious runners does put me in single digit range for most distance ..well, all distances beyond a mile. An ultimate goal of mine is to be able to finish in the top 50% of any race I enter. From the charts on Smashrun it looks like I need a mile time of about 8:14 to be at 50%. 36 minutes and change is my best 5K time and I’m figuring by next year at this time I should be knocking at sub 30s door – maybe not all the way there but somewhere between 30 and 35 minutes for the 5K and hopefully closer to 30 than 35. That’s about as far as my vision takes me right now. Sort of focusing on the goals closer at hand and letting the rest works their way out in time. 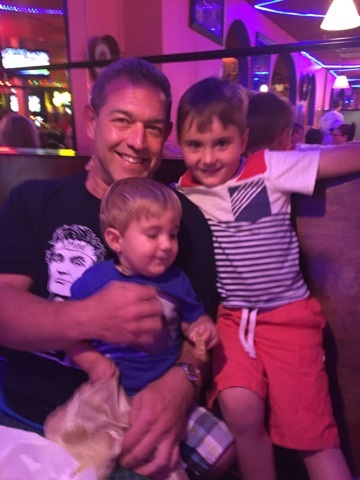 1.5 bottles of water consumed – feeling full and waterlogged…. I’d be lying if i said i wasn’t nervous about this upcoming run. I suppose that is a bit typical. I should be able to do better than the last two full marathons. The BIG difference with this one coming up is that it starts at MIDNIGHT… that’s a pretty large deviation from the norm. guess there’s only one way to find out what’s going to happen and that’s to do it. I checked the driving mileage yesterday and we’re looking at a 5 hour 32 minute drive. I had 4 hours in my head but that’s only to Nashville. After this Saturday’s full marathon I should be able to cut back on the running stress levels quite a bit and focus more on leveling up with the Half Fanatics with the ultimate goal of completing 30 half marathons in 30 different states in 365 days. We’ll see how close I can get to that. There is a chance to pull off a double half marathon weekend in August with one half marathon either in Iowa or Wisconsin on a Saturday and another one in Minnesota on Sunday. The next double half weekend chance could be in October with the Brooklyn half on Sat in New York and the Shades of Death half in New Jersey the following day. Beyond that, in 2016, I’ve looked at a series of 3 half marathons in 3 days in 3 states – part of the Riverboat series of races promoted by MainlyMarathons which could knock out Louisiana, Arkansas and Mississippi. Tennessee, Kentucky, Missouri and Illinois are four more races in that series but I’m already signed up for the Country Music marathon in Nashville next year and could always drop that to a half if I don’t have any other runs in that state and Paducah, Kentucky is literally only a couple hours from where I live and I know they have a run there and, if not, Louisville isn’t all that far either. Missouri & Illinois are already well covered. Which reminds me – I’m also part of the 100 Half Marathon club which is a pretty cool little club. Membership is only $5 per year or $20 for a lifetime membership and there are a host of discount codes which can pay for the membership in a very short period of time. 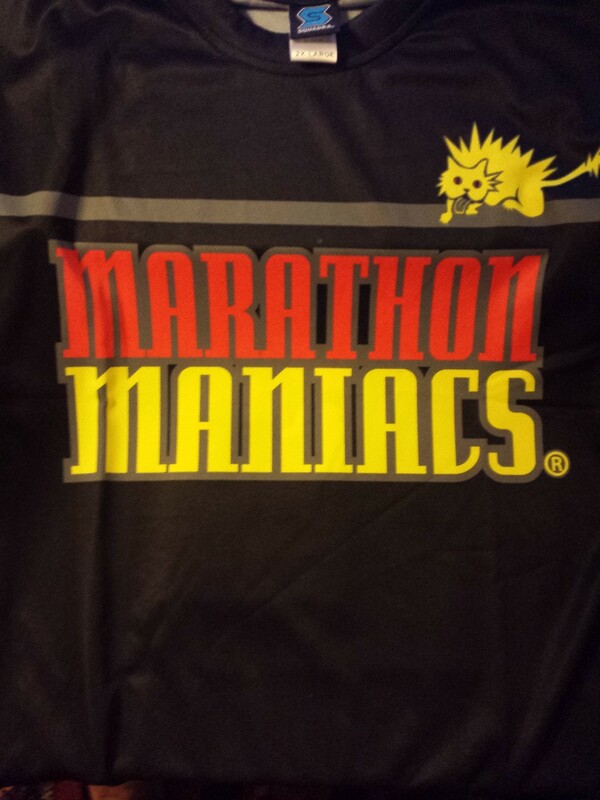 I know the MainlyMarathons group offers $10 off per race so, two races and I’ve got my money back and, I’m looking at 3 in April 2016. 7 halfs in 7 states in 7 days. I could cover every state NorthEast of NewYork in 6 days; from May 15th through May 20th and I’m already signed up for a run on 21st in Indiana. Based on this year’s New England series, New York should be the last state in 2016 and that’s when I’ll drive back and do the Geist Half Marathon in Fisher, Indiana. I kinda like the complex, the improbable. I like the idea of improving to the point where I can run a half marathon every single day for 7 days straight. With those two aspects in place, The speed should take care of itself. plus …I do keep getting lighter every month and that’s certainly going to help as well. 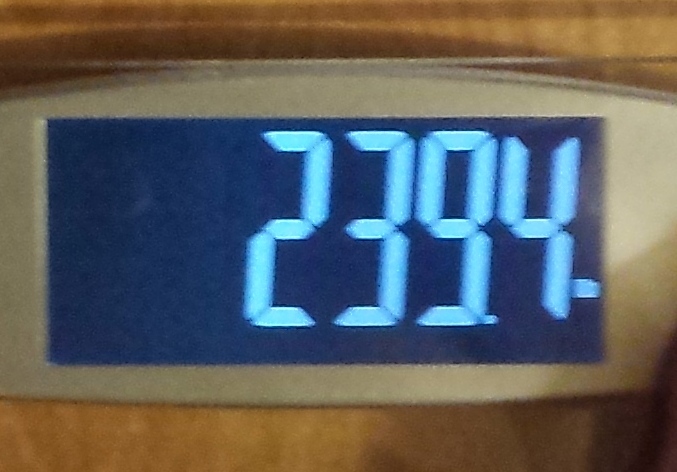 One weigh-in for the last two months of May & June each included one weight in the 250s. which gave me an average weight of 248 for each month. 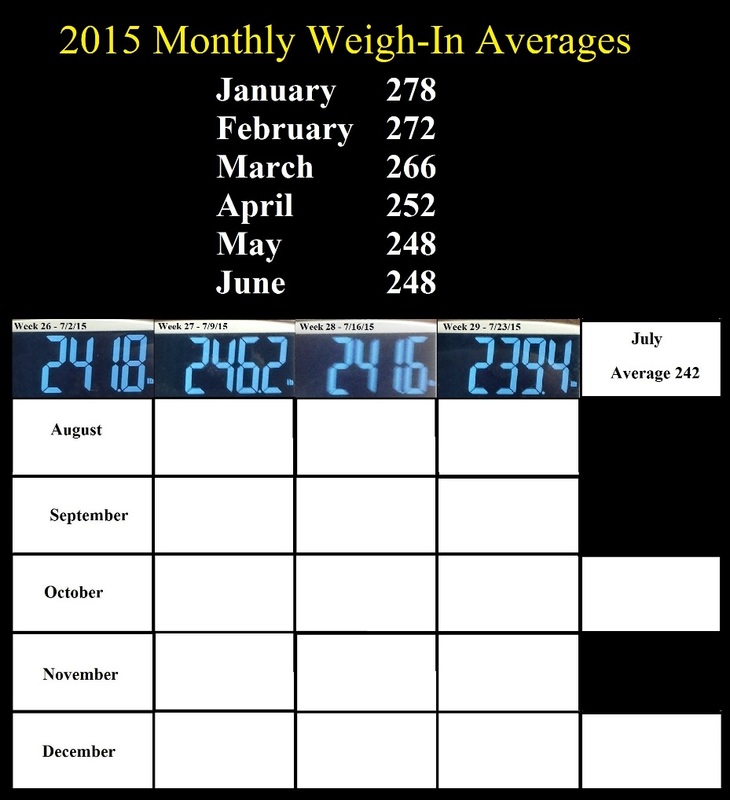 For July here, it looks like every weigh-in will be in the 240s and we should end up with an average weight below 245. If my average is below 245 then I’ll achieve another goal set for this year which was to weigh in the low 240s. In the back of my mind, I would like to gently push my one hour pace up to 5 miles. Right now I’m hitting 4.25 miles per hour in training. I’d like to see 5 miles per hour in training. and god …what a difference there is between training times and racing times. 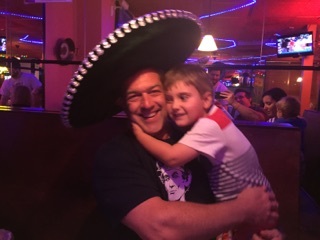 But, as fate would have it, there was a nice family dinner last night to help celebrate my birthday so I knew this mornings weight would reflect an increased volume of food in the IG tract so, 246.2 is the reality of the situation which gives me a 244 lb average weight for the month. I’m pretty certain we’ll see an average weight in the low 240s this month, meaning anywhere from 240-245 even with today’s heavier than expected (wanted) weigh in. After two months weighing an average of 248 in May & June, I think we’re seeing a breakthrough! For July, my first weigh-in is 241.8 🙂 I also have a new wallpaper for my laptop for all my weigh ins during the second half of 2015 so, for now there is only today’s weigh-in.